They’ve previously been involved in raising money for their chosen charity, Tenovus, at an inspiring concert organised by the Tenvous Sing With Us choir. 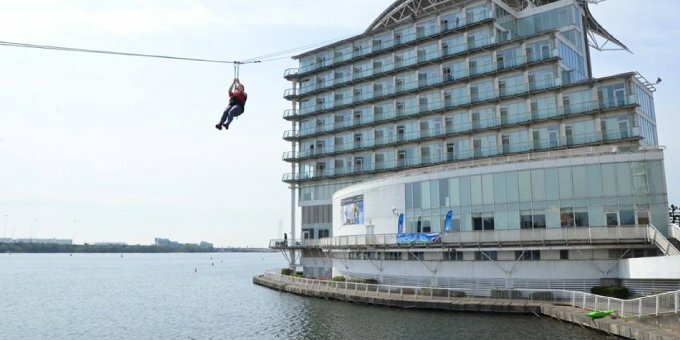 But earlier this year, adrenaline-junky staff members were given the opportunity to take part in something more extreme – a 190ft Zip Wire! 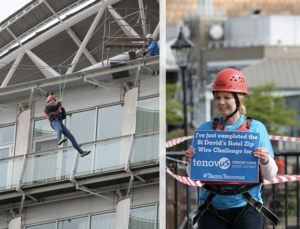 Tamsin Gifford, Hazel Shine, Tracey James, Stuart Knight, Kim Oni, David Perry and Arron Fry all volunteered for the challenge and on Friday 1st May, they were strapped in and ready to leap from the roof of St David’s Hotel in Cardiff. There were plenty of butterflies, a few screams as volunteers leapt off the building – and lots of laughter when it was all over. 118 118 Money CEO Paul Noble even took part, braving the zipwire alongside his team. The volunteers had an £800 goal, but unsurprisingly the James Bond-style stunt saw them smash that target to reach £1,250. The event proved a great platform for 118 118 promote their fundraising efforts, and the cash even came in from across the Atlantic as American colleagues were suitably wowed!